NETANYAHU HELPED ROB AMERICAN NATIONAL NUCLEAR SECRETS AND TRIGGERS IN 1980s = ISRAELI SMUGGLING RING | Concise Politics -- Your Time should NOT be wasted. Israel targeted U.S. = June 27, 2012 Declassified FBI release of 1985–2002 investigation into network of Israeli front companies connected to the Israeli Ministry of Defense illegally smuggled nuclear triggers out of the U.S. CONVICTED = Richard Kelly Smyth was convicted of running a U.S. front company = Met with Netanyahu who worked in Israel NODE of “Project Pinto” Nuke smuggling operation = Heli Trading Company. Milchen, now a Hollywood producer, was recruited into Israel’s economic espionage division (LAKAM) in his 20s toestablished front companies and secret bank accounts for NUKE smuggling operations = Encouraged Smyth, a California engineer, to incorporate MILCO in 1972 and serve as a front for the Israel-based Heli Trading’s (also known as Milchan Limited) acquisitions of sensitive military technologies on behalf of the Ministry of Defense. Smyth fled U.S. after being indicted but in July 2001, was arrested in Spain by Interpol and returned to the U.S., and in November, and was convicted of exporting 800 nuclear triggers (called krytrons) = Smyth on April 16-17, 2002 told FBI details how during a trip to Israel Smyth was “spotted” by Milchan, who claimed he worked as an exclusive purchasing agent for the Ministry of Defense = Met Ariel Sharon and Netanyahu, who worked at Heli Trading Company = “Smyth and Netanyahu met in restaurants in Tel Aviv and in Netanyahu’s home and/or business to exchange material. = Netanyahu’s company was paid for the ROBBERY of the NUKE KRYTRONS. Milchan and Smyth were close visiting in Milchan’s glamorous life as a movie director = Dinner frequently and visits to homes often + Hollywood parties. Report reveals = MILCO illegally shipped prohibited articles under general Commerce Department export licenses rather than smuggling them out via Israeli diplomatic pouches. 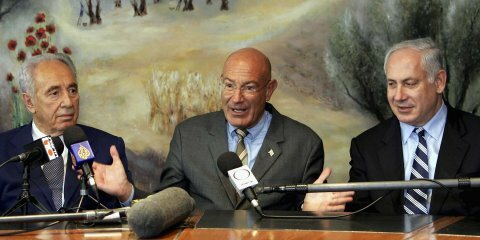 NETANYAHU COVERUP = March 2012 TOLD Milchan + Shimon Peres to avoid any public discussion of the book Confidential. Netanyahu’s = Hands are all over the nuclear SECRETS AND TRIGGERS ROBBERY OF USA SECRETS. This entry was posted in NETANYAHU HELPED ROB AMERICAN NATIONAL NUCLEAR SECRETS AND TRIGGERS IN 1980s = ISRAELI SMUGGLING RING and tagged NETANYAHU HELPED ROB AMERICAN NATIONAL NUCLEAR SECRETS AND TRIGGERS IN 1980s = ISRAELI SMUGGLING RING. Bookmark the permalink.